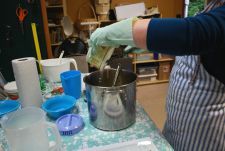 Creating a goats milk soap recipe is something I always wanted to do but I was put off by the steps involved and by the sometimes darker colour of the resulting soaps. Kind of silly, I know, but I really wanted my milk soap to have a nice creamy looking appearance. 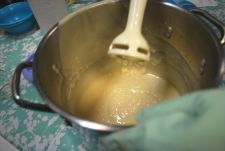 Many milk soap recipes involve freezing the milk in order to stop it from overheating and burning once the lye has been added to it. Milk burnt by lye tends to turn orange. 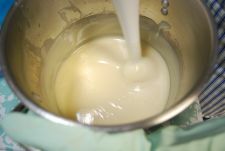 Through experimentation, I have found that with a few simple alterations to the usual method of making a milk soap, you can create a lightly coloured goats milk soap and not have to worry about freezing or burning the milk. For this recipe I have used the room temperature method of soap making along with fresh goats milk, powdered coconut milk (only because I ran out of powdered goats milk) and white mica to create the swirl. 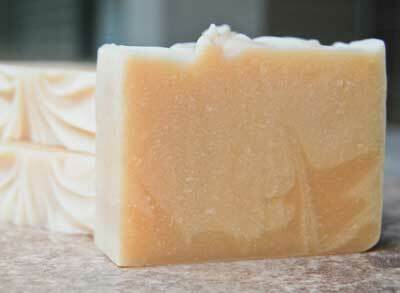 The resulting soap is a lovely light tone on tone marble that has a little bit of sparkle. In the picture below you can see the two tones of colour, the lighter contains the mica and the darker does not. This batch of soap did gel and would have been quite a bit lighter if it had not. So go ahead and give this goats milk soap recipe a try. 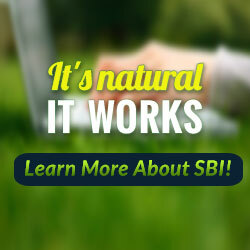 You'll find it quick, easy and a pleasure to make. 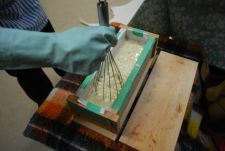 This method of making goats milk soap adds the milk after the soap has reached a light trace. 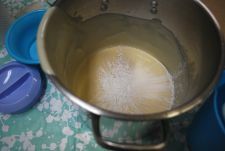 Since the lye is added to water rather than milk, I fortify the fresh milk that is added in later with powdered milk making it much stronger. 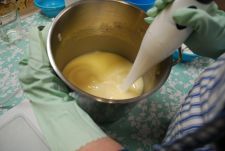 By making the soap this way, I am able to produce a full milk soap without adding the lye to the milk. This drastically reduces the risk of burnt milk and most often produces a lighter coloured soap. Distilled Water - 215 gr. | 7.58 oz. Goat Milk (fresh) - 100 gr. | 3.53 oz. Lye - 128.2 gr. | 4.5 oz. Lavender E/O - 36 gr. Goat Milk Powder (or Coconut Milk Powder) - 25 gr. **If you cannot find ethically sourced palm oil or would prefer to not use palm oil at all, it can be substituted with lard, tallow, shea butter, cocoa butter, mango butter, etc. Re-run the recipe through a lye calculator before you make it. 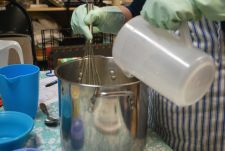 Begin making the soap by weighing out all the ingredients except the sodium hydroxide. Make sure to break up any large bits of the hard oils into smaller chunks...they will melt much better if they are small. 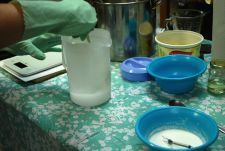 Add the coconut milk powder (or goats milk powder) to the fresh goats milk and mix until no lumps remain. This can take a little bit of work. Heating the milk a little seems to help. Weigh the sodium hydroxide, dissolve it into the water and mix until the the lye has completely dissolved. Gently pour the lye solution over the hard oils and let the heat of the lye melt the hard oils. Slowly stir the mixture until no lumps remain. Use your whisk to mash the hard chunks of oil. The solution will have started to go opaque by the time the hard oils have melted. 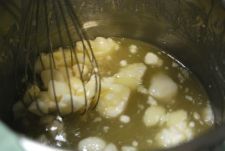 Add in the soft oils and whisk until the soap batter reaches a light trace. Pour in the goats milk mixture and any scent you are adding. Blend until a medium trace occurs. 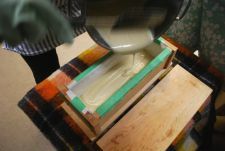 If you are going to marble the soap as I did, now would be the time to pour some of the soap batter into the soap mould. I poured about 1/3 of the base into the mould. 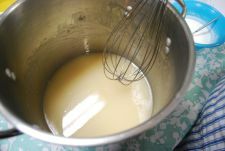 Add the white mica to the remaining soap batter and stick blend until it is thoroughly incorporated. 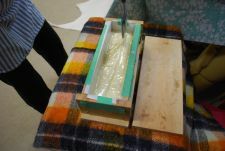 Pour the soap into the mould over the non-mica soap and use your spatula to marble the two layers together. I also plunged the whisk into the soap to give it a bit of a textured top. 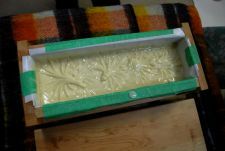 The soap is now ready to be insulated if you want it to gel. It is a good idea to keep an eye on the soap since the milk can heat it up quite a bit. Be sure to open the soap up once it has reached the gel stage so that it does not overheat. If you do not want the soap to gel, do not insulate the soap. Some people have been known to put a milk soap in the fridge to stop it from gelling. And that's all there is to it. 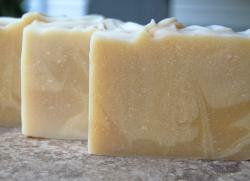 A wonderful goats milk soap recipe that is fun and easy to make. Return to the top of the Goats Milk Soap Recipe page.